This is a heavily updated version as of 2012-05-02. The map layout of this mission is quite simple. Strive forward, take out two summon portals and finally kill the boss. The boss is by the way the wife of the Emperor Of Destruction, a guy with huge boots whom you will encounter in the mission “Battle Of The Red Cliff”. You can do the mission as soon as you reach level 120. Usually it is my point to show that you can do all (or at least most) of the TBS missions when you reach the minimum level for it. There were two exceptions so far: Troy’s Last Battle (minimum level 115) and Goddess’ Rage (minimum level 115). At least Fritz, my trusty musician alt, couldn’t do that, and in case of Last Battle still can’t solo it. A third exception was The Shaman Returns – until Fritz passed the level 120 upgrade quest. Why? Because the sole condition to be able to do this mission is the ability to take out the tree monster summons in one turn. With meteor strike at level 60 my witch couldn’t kill them, even with the help of Ravaging Melody, so a lot of pissed off trees came down on my group. Of course I could kill them eventually but then the next group had already arrived and the problems began. The summon portals in this mission do their job pretty well. After Fritz had passed the upgrade quest (and jumped to level 122 at once, because of all the xp TBS missions gave him) and after upgrading and skilling the witch this mission became quite easy because now the witch can kill all tree monsters with one meteor strike. I have made a video about my second run, shown below. It would be very unconvenient to run into them with your strike-ready witch, then to be slaughtered by a horde of trees. Every summon portal is guarded by a kind of mini-boss. Those guys are quite weak. Their death each triggers a cut-scene. Only afterwards the summon portals can be destroyed. If you have a lot of time left you can farm the second summon portal. Instead of destroying it, camp with your witch in front of it. Every four turns the portal spews forth a group of tree mobs, right in time for your witch to take them out. This video does not show it because while it is interesting for Fritz to do it (the loot is quite decent) it is boring for you as spectators. Let there be 10 minutes for the boss fight left. In the video shown I needed 4:15 minutes from the moment the second summon portal was down until the moment the final boss died (which will give you three more minutes, so that you won’t fail the mission after you reached the objective). The boss fight itself is nothing special except for the boss interrupting the fight twice. That seems to depend from the amount of damage she has taken. A certain amount triggers the first and second cut-scene inmidst of the boss fight, positioning her back in her original area and summoning new tree monsters. That is meant to irritate and endanger you but in fact that is quite helpful. You can draw back, heal up and generally regroup as well. And here is a video where Claudia stormed through the mission (2011-09-24). This video accidentally shows a bug, by the way: The game said I had fulfilled the mission but the boss is not dead. Update 2011-09-24: Still not found the other flame trap. 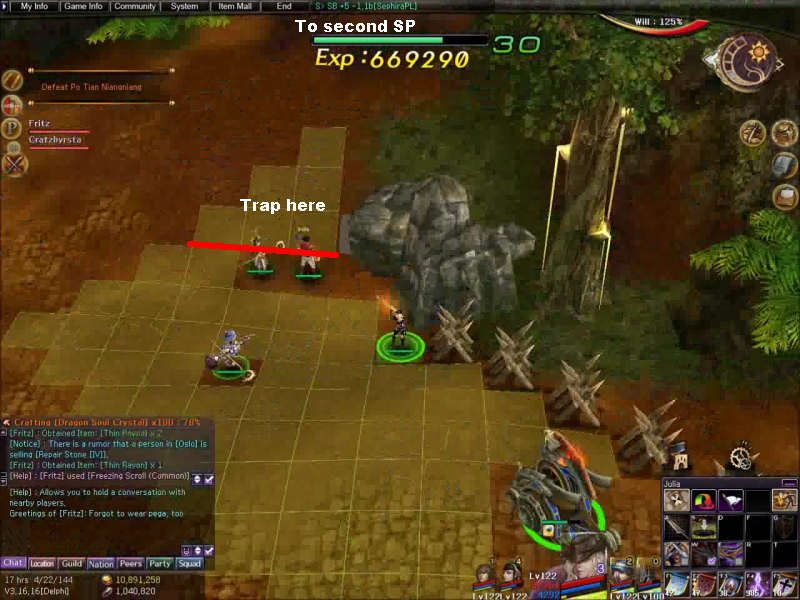 Do you have the trap map for FT/HP? Yes. Click on the link “Mission Maps” (right column, scroll to the top) and search for them. May be you must click there on “Older Entries” to get to them. How easy is this mission to do, if I were at 121 with my team? Plan to go with spearmain, spartan, oracle and witch. Any idea? You never really touched on how hard this is also. Any suggestions for lower level people trying to solo this? You must be able to kill the normal mobs with one shot with your damage dealer reliably. It qualifies of course if she or he is sethed, beast-souled or whatever (even my sheriff can’t one-shot kill every monster without such a buff). The problem won’t be the quality but the quantity of monsters. Each monster alone is no real danger for you. I would rate them slightly below the Spy Hunt class. But as already written above the summon portals mass-spawn here. If you are not able to kill faster than they produce monsters you are doomed. I will make a video in the foreseeable future of this mission. While I have to use my heavily overgeared party you will at least be able to estimate the opposition. Ok, please tell me your username and password. For low mighters, you can try taking Witch and Elementalist. With high skill/attack boost, witch can take out trees with 1 meteor (lvl 84 meteor at 195% attack at least), and while BE can’t kill outright, they do weaken the mobs a lot, allowing an easy kill even with poor equips. I think FA will kill the mobs in 1 turn but I’ll have to test it again. However, it’ll take 3 turns of CD instead of 2, which may be significant due to the spawn rate of trees, and this is also why Elementalist is more important than Witch due to her 4 turns CD. The portals will spawn 4 treant-like mobs every 4 turns. I know this because I use the second, upper one for itemfarming. Every time my Flame Blow is ready a new group of 4 spawns from the summon gate (and FB has a cooldown of 4). As soon as you have killed the first portal (1 catapult shot is enough) the missione becomes easier. The 2 minibosses are no real threat for they take only a few hits before they die. In this mission more than in most others it’s vitally important that you can one-hit groups of mobs. Meteor Strike and Flame Blow, for example, work great. Cannons/Guns – even if sethed – can’t cope with the sheer area (5×5) of these skills but of course they do a great job as well (and have no cooldown…). The real boss is very easy if you pull back as soon as she teleports away. If you run back far enough the spawning mobs (they spawn a bit behind the position she teleports to) will loose aggro on you and won’t engage. This also gives you more time for potting/rezzing/healing/whatever. Be careful with your catapult, they cost insane 15m in this mission and tend to get destroyed easily. 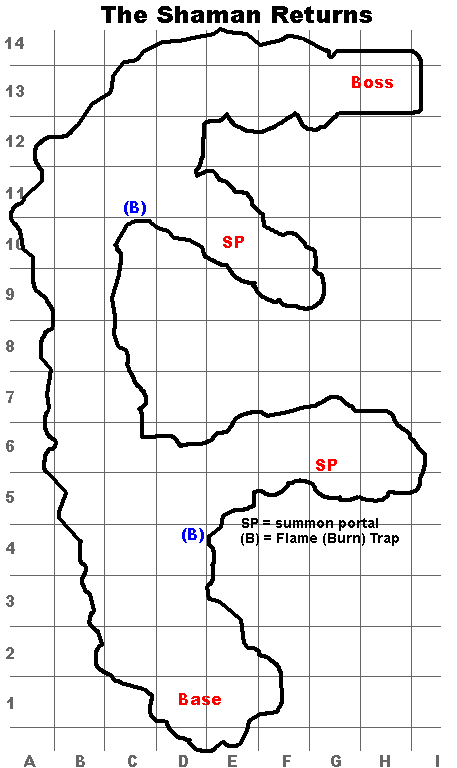 Theres a Flame trap 3 blocks away from 2nd summon portal also. I dont bring cannons to tbs so i destroy it with druid and poped the trap lol! There is most definitely a flame trap by the 2nd gate. Nearly dead-center of D10. There’s something weird about this map. Each time I do it, the position of the starting mobs are different (might not be restricted to starting mobs, sometimes I feel that even mobs further down are different, for example, I remember the 2 mobs near the boss were gun, but sometimes I see them as spear or something else). There’s also once when all the mobs rushed at me while I was moving from C6 to B11, including the miniboss. I will add it as soon as possible. Tried this mission as soon as i hit 120. brought my usual staffM+witch+oracle+janni form. By the way, dont trust the video. It seems so easy for him, as hes lv140, but at 120 with freezing+7 weps, i have to spam all of my mercs attacks on one monster to actually kill him. Stanced and sethed Jani dont kill the mobs, nor do the cata. I’m 132, bow main (+4 nix bow). Team was witch (+3DG staff), oracle and pirate (+2 and +3 DG swords). I tried several times – never ever reached the first summon gate. Teamed up with an other 132 guy – we could do it, but not easy. So is it REALLY an easy TBS??? Yes, it is quite easy. The beginning was hell. I basically got wiped out on my first attempt to take the first portal, but saved my catapult and resurrected at base. Then I advanced slowly, making sure to keep buffs up. Things start going poorly, but cata manages to sneak in and take out the portal, allowing me to use the double turn to effectively regroup/recover/lessen the opposition. From there, it was a slow but not overly complicated advance (had to use a couple more res scrolls later, but nothing like the half dozen i used to get the first portal) and managed to finish with about 20-25 minutes left. So there! This mission can be beaten solo directly at 120, and even with a generally not-so-great TBS main (although I love my saw to death). The elementalist was big here though – if I’d gone my normal group and had my 115 witch in instead I probably would’ve lost. Blazing Earth was invaluable in weakening the trees, as while the Janissary when fully buffed could one-shot mobs, it wasn’t 100% consistent. Regardless, whew! I definitely need to take a break from TBS for the rest of the day after that, because it was intense. and to comment on a couple things above: seth’d catapult almost 100% of the time would one shot its direct target, usually getting additional kills. Un-seth’d cata could 1shot at least its direct target most of the time (if it was a tree). Janissary was in the same boat – he had roughly similar results. That’s why blazing earth and an elementalist is great to use here (as another user had mentioned) – she can use it quite often, for great chunks of damage, and it allows your other mercs to easily squish the rest of the opposition. Oops, forgot to mention – there’s another trap present in this mission – it’s at about the corner of D10 and E11, right in front of the summon portal. Might have missed it before as your cata can easily shoot the portal without tripping it, but you’ll hit it you try to run up to it. I duoed this with my fiance. We’ve come to the conclusion that we wouldn’t have been able to solo it, but it was definitely doable duo’ed. We didn’t take any chances with farming the second summon gate; we were both virgins after all. 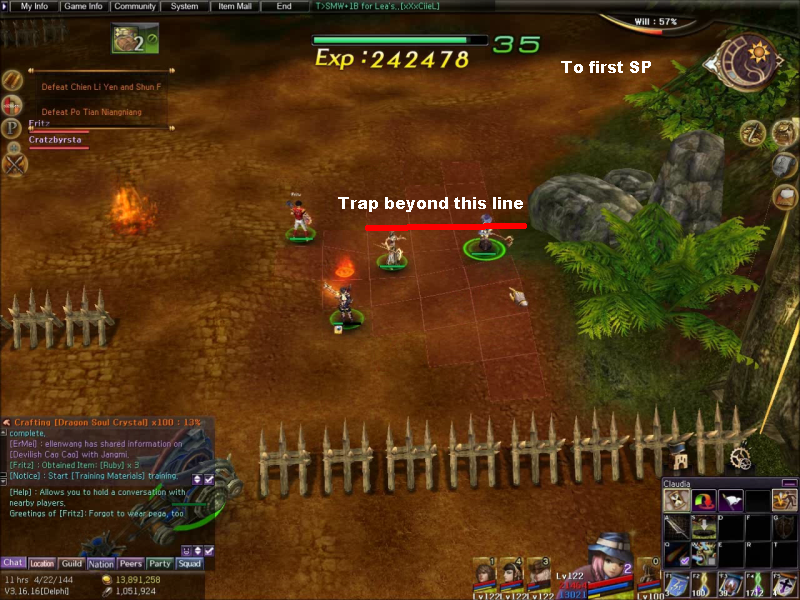 We hit only one of the known traps, the very first one. It was quite fun actually. My fiance’s tbs mercs, namely his oracle, are very undergeared, and yet his squad wiped once due to a strategically placed aoe from one of the mobs. Otherwise, his underleveled/undergeared squad lived. took me three tries but I solo’d this for the first time today.Staff main121/witch117/oracle112/Divinchi113..all with+3nix gear cross the board or +5divine. I had my atk buff at 216% and def at 130% between feasts and Title. Its intense but I raced to take out the first mini boss and first portal then steadily fought my way inch by inch to the second boss and portal blasting away with flame-blow and meteor strike every opportunity i got. awesome run. I earned the followings last run of my alishan 120. Im lvl 134 with staffM. and tons of other mats. I do this tbs twice a week, because what I earn is more than any reward from other tbs. Farming at gate, don’t you? Done this yesterday with my 126 saw main/122 jani/120 witch/123 Oracle. Really easy,just rush to the first gate and everything will be good. Sawmain AoE have been really useful here. I could have farmed the 2nd gate ,I didn’t do that just because it was my first run and I didn’t want to loose time. Another important thing has been the fact that Saw main can tank. So even melees can do this mission easily,tankers here are always welcome to stop the incoming trees. The main isnt very well equipped- +2 nix staff, +0 nix gear. Neither is the Witch, tho she has 100 rings,and lv80 bracelets, and earrings. What of StaffM, Witch, Ele, and Oracle? Again 120. Or should I wait til 121 for DG gears and/or a better gun? Especially good are the videos of John Farson (jfarson on youtube). There is a thread of him in the official forum, too, where he explains staff main strategies. Update 2012-07-08: It seems the videos of John Farson are not on youtube anymore – at least I cannot find them now. If I do try it solo before you get a chance to do it with an upgraded Fritz, I’ll give you an update, but I ain’t that ballsy, lol. I think an insturment main+oracle+witch+janis/sherif at lvl 122 or higher will be enough to solo this TBS comfortably…. Hm, I could use Brody’s weapons but I am so stingy with my coupons. It won’t help me in the long run if I use those. I only get accustomed to easy runs and when the coupons run out I would have to face the reality – which is: I can’t do it. After finishing the upgrade quest I will come back to this mission, of course. Hahaha from 60 brody’s letter I got, I still have 32 weapon box and 2 armor box… At first the weapons stats was three times a +7 freezing weapon should be but not the armors.. After the RoR patch now it changed to normal..
Btw, the last time I ran this mission was a fail… that was the first time I face about 7 mobs+1 mini boss right in front the base…1 mob on sight as I move forward 2 mobs on the left before barricades, two outsides the barricades, 2 mobs on right side after the barricades… and they suddenly join when I hit the mini boss..
As you can see, Rosyid, you are completely right. The difference between a witch which is upgraded to meteor strike level 70, with the better charms, and a witch un-upgraded is striking (pun intended). Now it is very easy, before it was impossible. You should play my videos with HQ enabled (go to the “cog”-icon in the youtube-video-player and choose “720HD”). Then play it in full screen. That way you get the resolution I have recorded them in (1280×960). And then you see the rings in their full glory. For me it was more important that my witch was upgraded and had meteor strike at 70 (and could use better charms). That was the difference between kill all in one strike and fail. anyway… i always wonder how you can get that so many hits… can you give me recommend gear? (my staffM and witch always die in 2-3 turns… but well FB+MS sometimes survive me).i use StaffM+witch+oracle+janissary. i still dont pass level 120 upgrade. maybe after pass it i can forget about my rest mercs and focus on tbs mercs equip. It is very normal that in a staff/witch/ora formation your toons die all the time. I have a second alt (Claudiana) which has the same setup as yours. While they are doing ok, they die often. But that does not matter because the cool down still runs, even while they are dead. And in that formation you can use your oracle to actually heal sometimes – you have only to seth your janissary. The 120 upgrade quest was easy (and Fritz had only 2 +10 endurance rings – which should be affordable then because you have done a lot of TBS runs already, haven’t you!!). At which point are you stuck? You have another alt again?? Yay!! Can you make videos with that set up? Because usually videos i found on youtube don’t have so nice guide… (Or maybe overlevel). Making videos is a lot of work. So it is doubtful that I will push Claudiana in the limelight of the public with a video. And there are a lot of staff main videos around. As far as I know John Farson has made some with naked staff mains – search for it (jfarson is the youtube user name, as far as I remember – or something quite similar). I don’t see that much need for staff main videos. Is that enough for me to do this TBS with sword main? do i have to grow the seth’s will to lvl70? and, do i have to use the deathprof title? and when the time that i have to activate the title? Tree monsters vs. mini-boss: That was no luck, that was intended :) But the tree monsters have lost their threat potential because my witch can kill them with one strike. If your witch has also the proper necklace (shimmering opal) and the proper charms (the III ones), you are all set. No need for seth’s will 70 or deathproof. But if you find it in your heart to buy a dragon god gun+5 (or something like that) which costs you only 2 b – meaning about 2 weeks TBS for you – that will help greatly. I don’t want to put water in your wine but solo mode is an entirely different thing. But on the other hand: This is one of the missions where a staff main would be evidently better than a musician main (as Fritz is). Because here you REALLY need aoes. Oracle with lvel 60 of seth will and lvel 60 of healing. Use bless potion, patriot title, 20% atk feast, and 11% atk from guild. Note : don’t wait till the upgrades complete (you have to move quickly), seth your sheriff coz the monster are located RANDOM each time you started the mission. Try to reach the summon portal ASAP. The finnal boss 2 times intrupt the fighting, when the first time intrupt, try to bait her with one of your merc (i use witch), she will come without her trees. And continue the fighting. Seccond interupt, she will go back again. Don’t bait her, make sure if your sheriff and cata is sethed and CE with meteor is ready to cast. When you go to the front, wait till the trees come approach with the boss (make sure all of them are located in the 5×5 area of meteor), CE the boss and attack them till she died. Add my facebook if you want to ask anoter about this mission…. In my runs the monsters group very nicely and the witch is awesome. Of course hwarang with sheriff is also very good. I usually wait until the trees are mingling with the preset monsters so that I can kill them all at one stroke. Works every time (at least for me). Tips: guys, I dont know what did U guys done, but this work for me, dont rush killing the 1st SP by all cost at the beginning. 1. Slowly reach the 1st mini boss while upgrading. Use sethed Cata to kill the monkey, and use the ranger of your team to attack the spear/bear mobs. 2. When 3rd upgrade is done, start to attack the 1st mini boss. Why? because at this moment, the 1st waves of tree from the SP come right next to the miniboss, so U can meteo all of them at once. This should be the 1st Meteo in the TBS because Sethed Cata can 90% 1-hit the monkey, or take out 70% or above the HP of spear/bear. Meteo the boss+tree, (meteo 60 + charm 15 + necklace 3 + 2 bracelet) then use the cata to take out the last drop of HP on trees. This is the same with meteo 60 or 70 in the new diabolic patch …. deal with it. 3. Stand right next to the stone (after dismantling the traps, your way) with a cross formation, then tank the next waves of trees. should be 2 tree if U do it right. Then slowly advance with the speed of 3 square or so each turn while killing these 2 trees. This should not be a problem because a sethed cata can take 70% HP of a tree, your team should not be that weak to kill the 30% left, right? Until this, flame blow is still not used, which mean any main can go to this place. Of course, this require some positioning which come from your own experience of TBS. I cannot help on this. U will find out Claudius do this pretty easy, what U really need to pay attention is not his gears or damage, think about how he moves and stand. 4. Now, when the next waves of trees is in your sight, Meteo is ready, this should be the moment when U almost finish the 5th upgrade. If U do it right U should be on E5. The trick here: meteo the trees, use your main, Ora, 4th merc to hit as U can, then let the cata do the honor mission: run straight forward and hit the SP. U will have 1 free turn when the SP is dead, so take advantage of it. Respond: 1. U got 1 more turn, even if U cannot kill them in this turn, U can still kill in next turn, right? and even if U cannot kill the trees in the next turn also (whatever the reason) U can still run, just run the cata right away and let your team aggro the mobs, the worst scenarios is all your team is dead, cata escaped, U regroup the team in base and there is 1 SP left => nothing to worry about. 2. Mobs from SP always run automatically to the nearest place of your allies force (which is you) so as long as U survive, they wont go to base. Until the dead of the 1st SP, I dont use any flame blow, so it will be possible for U guys too. Invest 3 phoenix scroll at max to kill 1st SP, and profit later, is it that hard? Beside, many person asked this: why did the mobs kill my Oracle instead of Merc A, merc B? This is my respond: mobs in skirmish/TBS attack the nearest: highest damage done to them – healer which just heal (amount of healed HP is counted as damage done to enemy mobs – in their opinion) – melee merc which is guarding – higher might. This may change a little, but the concept is like that, so hide your Oracle far away while healing ^_^ . Practice with her healing range will help. Claudia, thanks for the walkthrough. I did the two higher Alishan’s today for the first time and succeeded easily at both with psaw main, 130 (not upgraded). First I did Reclaiming Alishan taking main, arty (118) and oracle (128). It wasn’t until afterwards did I realize that it was a main+3 map. Oh well, it was quite easy. Did Shaman returns bringing sheriff with +0 OSG. She died too much. The only good thing about bringing her was having her AOE+PSaw Main AOE= lots of firewood left over. However, I prefer to just seth my PSaw main and let the trees agro her. With a +6 Evil saw she always one hits everything she touches. The mission was quite easy in my opinion. The only thing I want to point out (and I’m sorry since there are about 10 people already claiming others) is a burning trap at G14. It’s not a big deal, i was chasing a runaway dying tree with my catapult and it hit the trap. The tree killed my cata. can you give link youtube videos by john farson,im try to search that name but the result no found.